Jenny Lawson (aka the Bloggess) is someone who has come into my world fairly recently. Last month I read a review of this book in the library publication Booklist, and thought it sounded intriguing. Since it had not yet been published I hunted down her first book: Let’s Pretend This Never Happened. I read it on vacation and came to two conculsions. The first is that Jenny Lawson is a total wingnut, swears like a truck driver with Tourrette’s, and has a family that rivals the Adams Family when it comes to weirdness. The second is that Jenny Lawson is completely and unequivocally hysterical. There are some misguided people in this world who are easily offended by cursing, and I feel deeply sorry for these people. I believe the time one spends taking offense is inversely proportional to the amount of fun one has. I also know that trying to explain this to someone easily offended is like trying to convince a conspiracy theorist that no, McDonald’s is not own by Satanists. The title Furiously Happy is rather poignant. Jenny Lawson has made her writing career talking frankly about dealing with mental illness. She suffers from depression and anxiety and a host of taggers-on. She has good days and really terrible days. Her theory is that on her good days she needs to live them to the fullest–the craziest, brilliant, most memorable times she can conjure. Then, when the bad days return she will have those memories and be able to tell herself they will come again. “When cancer sufferers fight, recover, and go into remission we laud their bravery. We wear ribbons to celebrate their fight. We call them survivors. Because they are. I will admit that I have suffered from anxiety and depression. That’s not an easy thing to admit, especially when the whole purpose of this blog is to demonstrate my talents as a writer, and showcase my brilliant wit and sparkling humor. But I need to be true to who I am. Yes, I have struggled with anxiety and depression, but I would guess 99% of the people who have ever met me would never know it. I can speak in front of huge groups of people and not blink an eye. I give every impression of being warm, funny, and completely well-adjusted. I have to say that being married has done wonders for my state of mind. My husband, who is a self-proclaimed “happy jackass,” is the best medicine. He makes me laugh every day and really helps to keep me on an even keel. True, I may get tired more easily than the average person, I may need more downtime to recuperate after social events, but I am proud of the progress I have made in the last 20 years. If you would have told me when I was 21 that I would one day be married and not be the drama queen in the relationship I would have laughed and laughed. Funny how things turn out. 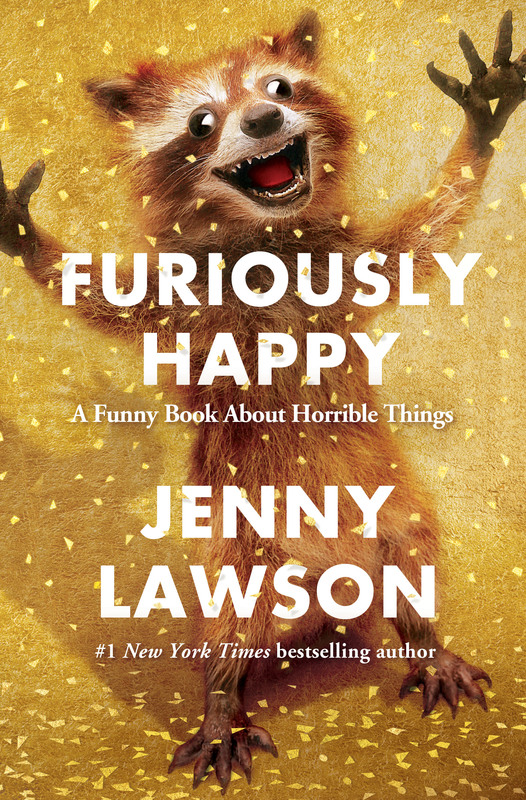 I do warm to Jenny’s idea of living furiously happy when the opportunity presents itself. I already know that traveling has made the best memories I keep and I want to do as much of it with my happy jackass as I can in this lifetime. The happiest I have been while not on the road is when I am writing, and creating stories. The worlds I create are so real to me that my husband and I speak of my characters like they live and breathe out there in the world somewhere. My greatest wish is to be able to do that as a full-time job instead of being a librarian. Don’t get me wrong, librarians are terribly important. But learn from my mistake and don’t ever expect to find fulfillment in a career you chose mostly because you needed a paycheck. To all of you out there who are like me and have struggled with anxiety and depression, I salute you. Keeping going when all you want to do is hide in your bed is no small feat, even if compared to the rest of the world it seems small. We are working with a serious disadvantage and have to toil much harder to stay even with the rest of the pack. I highly recommend Furiously Happy to anyone who suffers with mental illness or anyone who lives with one. It will make you understand things on a new level, give validation that you aren’t alone, and make you snort coffee out your nose. Which is why I don’t recommend reading it with a beverage. That really hurts.